Two years ago, in Las Vegas I heard a speaker by the name of Simon Bailey say, “what’s in the way IS the way”. That quote always made a great deal of sense to me and after reading this book it has officially been affirmed. 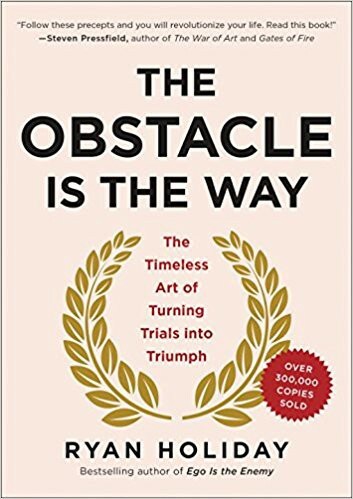 Ryan Holiday articulates a powerful message in this book — the obstacles which you perceive to be holding you back are the hidden catalyst to your growth if you can shift your mindset. Think about your life. Can you isolate a time in the past where something you perceived as negative took place, but today, standing in your powerful NOW, you can look back and say that your perceived negative moment turned out to be a blessing in disguise? My guess is that you have more than handful of examples in this regard that make for your best dinner stories and campfire tales. The trick becomes how to adjust your mindset to view obstacles, or perceived negative moments, as opportunities in real-time moments? A good place to start is by making a list of personal examples in your life where a negative situation turned out to be positive. If you can draw from your firsthand experiences, and attach your emotions to the positive outcome versus the short-term negative emotions, it will help you push through your current situation to achieve higher levels of performance. What determines our actions are the beliefs we hold, and the corresponding emotions that accompany our beliefs. So, to view obstacles as opportunities, you must first help your mind believe that “what’s in your way is in fact, your way”! 1. Focus on the process . It’s hard to argue with results. Right now, the best coach in college football is Nick Saban. What is it that sets Saban apart from his peers? He is relentless about executing the process and over communicating that message to his coaches and players. Your sales number this year isn’t changing and it isn’t going away, which leaves you one choice; be relentless about executing your coaching process, coaching activities, and coaching behaviors. The number you have to hit is important, but it is a lagging indicator — focus exclusively on your inputs, not the output. Any average manager can be a good coach when times are going well. The true test of greatness is how well a manager coaches when disaster, turmoil, and uncertainty strike. When everyone around you sees disaster and decides to pull back, you must be able to push forward and coach unconditionally. Be the coach who doubles down on your investments (your sales people) when the stock market crashes, and watch the returns you will get when the conditions bounce back to favorable. Your ability to gain trust and respect from your team will be judged by how you execute in high-pressure situations. 3. Think progress, not perfection . Helping your sales team turn obstacles into opportunities requires a strong mindset and the willingness to begin. Often, turning lemons into lemonade requires you to take courage and to start finding solutions to your challenges. Likely you won’t have the perfect answer at the onset, but if you focus on making progress, even if it means failure, you will find the solution. Strive for perfection of course, but realize you will never attain it, which is part of the fun — the joy is in the journey. This book struck a chord with me. Especially since in 1997 I was involved in a jet ski accident where I broke my jaw in three places, knocked out ten of my teeth, and came within an eyelash of losing my life. At the time, I’m sure that nobody saw this as a positive situation; however, knowing what I know now at age 35, that incident has had an overwhelmingly positive impact on my life and those around me. Books like this one are a great reminder for everyone that no matter how large or small the obstacle you are facing may be, there is a positive outcome waiting for you on the other side — so long as you are willing to go through it rather than run from it. And if one of your biggest obstacles is implementing a coaching/management process that will lead to top line revenue, then start with this E-book and feel free to schedule a time on my calendar to talk at your convenience. In his attempt to help individuals escape “The Matrix”, Tom Bilyeu, founder of Impact Theory, has a reading list of 25 books which he recommends that everyone read to better understand how they can unlock their potential. Others have embarked on this journey and I have decided to join them by dedicating myself to reading a book per week for the next 25 weeks. And if you’re the type of leader that wants to see your obstacles as opportunities, then subscribe to our monthly newsletter for more resources pertaining to growth, sales coaching, and leadership trends.